“Off Limits” – this exhibition is about the stories that are forbidden to speak for political or historical reasons, the stories about forgotten cities and forgotten people. The photo series are devoted to taboo themes that are relevant in different countries and societies from Greece to Argentina. It was shown at the Odesa Photo Days 2018 festival. The photo projects were selected among 212 applications from authors from 40 countries in the context of an open international competition. Starting from September 27th till October 14th Kyiv squat-gallery “Material Evidence” will represent the selected photo series of the exhibition “Off Limits” namely the following authors: Sergey Melnitchenko (Ukraine), Dmytro Kupriyan (Ukraine), Sergio Dominguez (Argentina), Alexis Huaccho (Perú), Olexandra Pavlovska (Ukraine), George Selley (Great Britain), Vasilis Papaspyropoulos (Greece), Svetlana Bulatova (Russia), Dimitriy Levdanski (Spain), Vasyl Salyga (Ukraine), David Verberckt (Belgium). 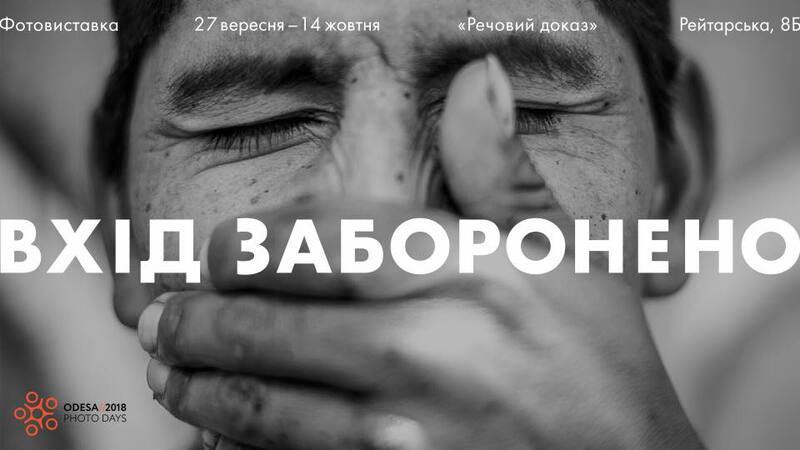 Odesa Photo Days (until 2018 – Odesa//Batumi Photo Days) appeared in 2015 as a reflection on the war in the east of Ukraine, political events and social media-manipulations. Every year, in April, the festival gathers in Odessa city professionals, amateurs and photo admirers. There were dozens of photo exhibitions, lectures, master classes, photo shows and parties during the four years of the festival existence. Most of the Odesa Photo Days events are free to viewers. The photo-festival’s geography spreads far beyond Ukraine: photographers and curators from South Korea, Singapore, the United States, Turkey, Finland, the Czech Republic, Switzerland and other countries came to the forum in different years. In 2018, among the guest speakers of the festival the photographer of Magnum Agency Alec Soth (USA) was invited. Squat-gallery “Material Evidence” (8B, Reytarska St.) arose on the place of the Educatorium art-center after its closure. Georgievsky Residence company has purchased a building at 8B, Reitarskaya street at no cost. The gallery was arrested as illegally alienated and found to be a material evidence. That is why the artists and activists called this new space as “Material Evidence”.